This Lake Runnymede engagement session is probably the most special to me to date because it involved one of my long time friends! I first met Nick when I was a senior in high school. Each week, before class together at Valencia College, he would tell me a new story about his girlfriend, Aly. I knew then their relationship was special, but it was just at the beginning of it’s bloom. 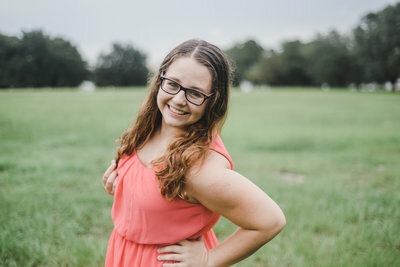 As we started at the University of Central Florida and reconnected, Aly was STILL all Nick talked about (besides carpentry). 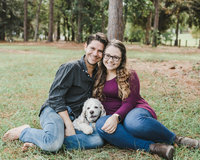 I loved getting to know her through him and when they FINALLY got engaged, I cried behind my computer screen (thanks, Facebook). Nick reached out to me about their Lake Runnymede engagement session and I couldn’t say no. Meeting Aly was a must! It had been 7 years of friendship, and still no Aly. We met at sunset for their session and we bonded immediately. Jack and Rocky joined us, and Rocky was a special form of entertainment for a special couple. This Lake Runnymede engagement session is also special because I had an interview with Aly for the session! She dove in to their relationship, the proposal, and even gave me some details on her STUNNING ring. Take a look! What makes your relationship special and unique? Tell me some things you both value in your time together. Nick and I have been through the ups and downs like every relationship, but we have found a way to make it last through the last few years of college and high school. We have a mutual love for staying at home, watching movies, and just being homebodies. Nick and I didn’t really do a lot of traveling until a few summer’s ago – now we love it! We are also very goal-oriented. I am a teacher and VERY Type-A personality. Nick knows how to handle all of my stress/anxiety that comes along with my job. He is the hardest working person that I know – he might be at work all day (even working overtime) and still come home and cook dinner for me or get a job around the house done that I ask him to do. AND HE NEVER COMPLAINS!! How did you know he was the one? When did you first know in your relationship? I think we were both just so extremely lucky to find “the one” in high school. Nick and I grew as friends first – we would spend almost every day after school together, hanging out with friends or going fishing (his choice, not mine!!). We didn’t really establish a relationship until one night I said, “Hey, I think we are more than friends” and he said, “Yeah, probably” – typical guy response. I don’t think Nick and I had an “I know you are the one” moment because we were so young when we met and started to fall for each other. However, over time, as we became older, Nick and I’s relationship is something truly special and something that will never be broken. Give me all the details about the proposal! How and where did it happen? Was it a surprise? What was the planning process? UGH THE PROPOSAL WAS AMAZING. Two summers ago, I begged and begged Nick to go to Europe with me for a few weeks. He was like “I don’t know, we will see.” My best friend and I planned a trip to go, but in the end, she couldn’t make it. Of course, Nick stepped up to the plate and said, “Okay, let’s book this thing and go!” So we spent two weeks walking around Europe – basically a new city every day. When we got to France, we spent the morning with our tour group going to see all the beautiful sights of Paris – Notre Dame, the gardens, and the Eiffel Tower. We went to the second story of the Eiffel Tower. After coming down, Nick told me he had to get something off of the bus. I was so annoyed, hungry, and HOT (OMG it is so hot in Europe in the summertime!!!). Let’s just get back on the bus and get some yummy French food, you know? Nick got off the bus and started rambling on about me trusting him. I thought to myself, “If I didn’t trust you, I wouldn’t have flown all the way to Europe with you!” Then, before I knew it, he was down on one knee with the ring box open asking me to marry him in front of the Eiffel Tower and all the people sitting on the lawn having a picnic. It. Was. Perfect! Also, I was too dehydrated to cry. Tell me about your ring! My ring is beautiful! Nick, of course, designed it. I wouldn’t have expected anything less. It is an oval princess cut diamond with detailing. Exactly what I had imagined and exceeded my expectations sooooo much! He did a great job! Sweet friends, I am SO happy that I was able to be a part of such a special moment in your lives! Nick, we’ve been friends for what feels like forever and I am so happy to see you happy. Aly is definitely a keeper! Take a peek into their super fun Lake Runnymede engagement session!